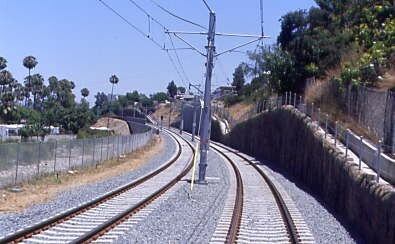 This trip came to my attention when I was handed a flyer for the excursion over the newly built San Diego Green Line extension at the Fullerton Railroad Days 2005 Celebration as I worked the Orange County Railroad Historical Society table there. I contacted Jeff Hartmann to see if he wanted to join me and he said "Yes!" 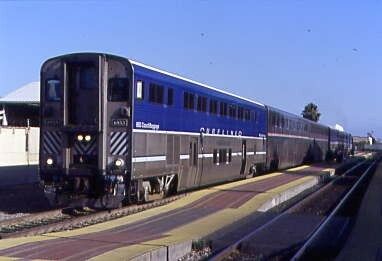 Our plan would be to take Surfliner 564 down to San Diego that morning, then the first Trolley we could over to the shops. 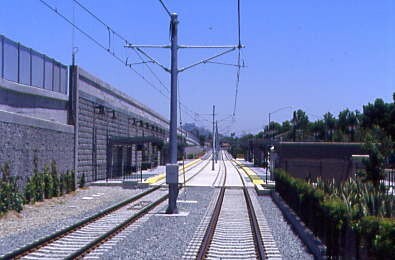 Our planned return would be the first Trolley back to the Santa Fe Station and Surfliner 785 home. 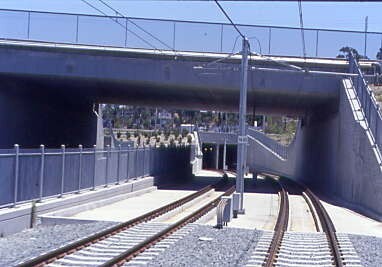 The Metropolitan Transit System has almost finished a 5.9-mile extension of the Trolley east through Mission Valley to La Mesa via an underground tunnel at San Diego State University (SDSU). Funded in part by TransNet, the county's half-cent sales tax for transportation improvements, this project fills a critical gap between the existing Blue and Orange lines. 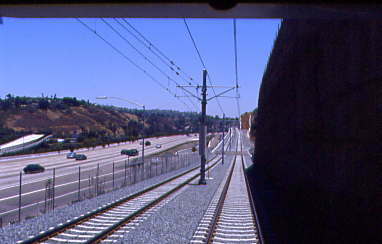 Planned by MTS in conjunction with the Cities of San Diego and La Mesa, the $506 million Mission Valley East extension, called the Green Line, will provide an important connection in the region's public transit system for those commuting to work, school, and events at Qualcomm Stadium and Petco Park. 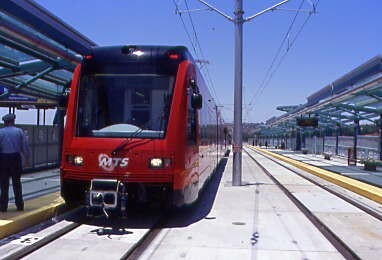 In addition, transit-oriented developments are planned along the route to co-locate residential and commercial projects around Trolley stations. There are four new stops along the Green Line. 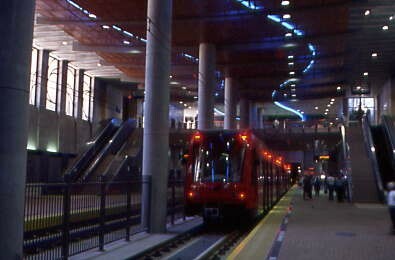 The SDSU underground trolley station is already garnering local, state, and national attention is a gem in the region's transportation system. 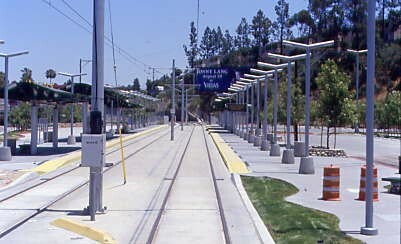 It is projected that over 4,300 students, faculty, staff and visitors to campus will use the SDSU Station each day. Other new stops along the Green Line are Grantville Station complete with a unique architectural design that features a set of 40-foot high elevated platforms and high-capacity elevators. 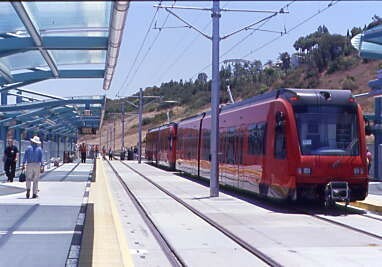 The two ground level stations are the Alvarado Hospital Medical Center Station and 70th Street Station. 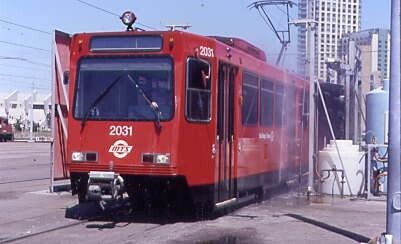 The San Diego Trolley was created by MTDB in August 1980 to be the regional light rail transit operator. It began South Line revenue operations on July 26, 1981. 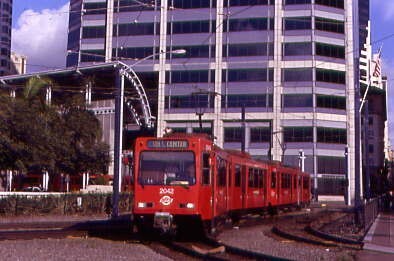 East Line to Euclid revenue operations began March 1986. 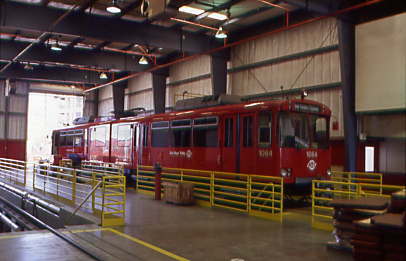 East Line to Spring Street revenue operations began May 1989. 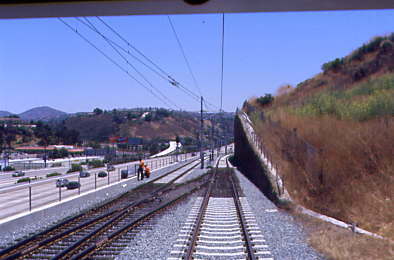 East Line to El Cajon Transit Center began June 1989. 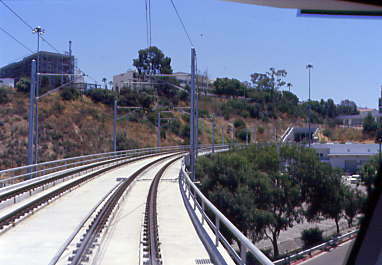 East Line to Bayside began on June 1990. 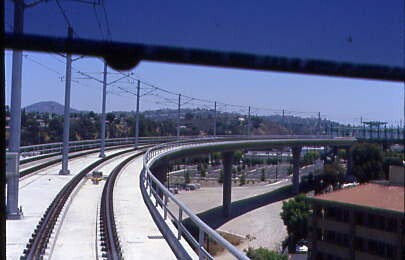 South Line extension to County Center/Little Italy began July 1992. 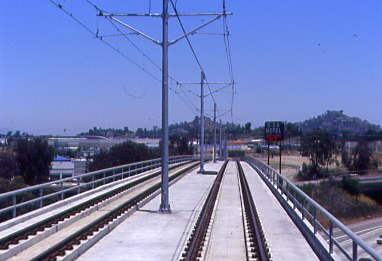 The East Line to Santee began August 1995. 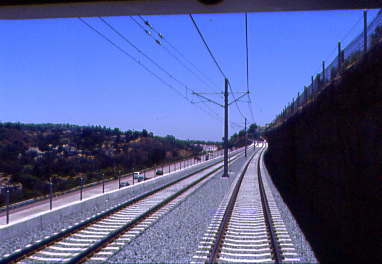 The North-South Line to Old Town began June 1996. 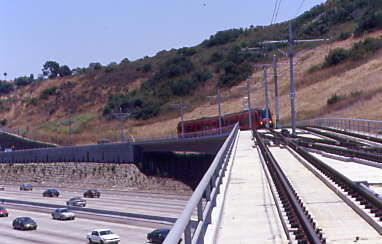 The 6.1-mile Mission Valley Blue Line extension was opened November 1997 with the East Line renamed Orange Line at the same time. 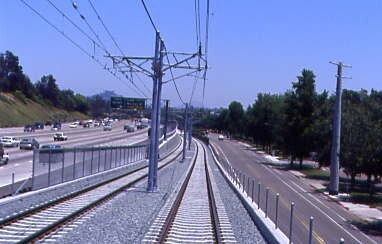 The new Green Line will begin July 2005. 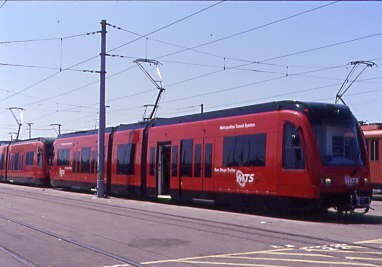 The San Diego Trolley has 134 light rail vehicles with 71 Siemens/Duewag U-2s, 52 SD-100s and 11 new S70s. The U2s and SD-100s are equipped with heating and air-conditioning. Each LRV seats 64 passengers and can accommodate 86 standees, totaling 150 per car, 200 crush load. 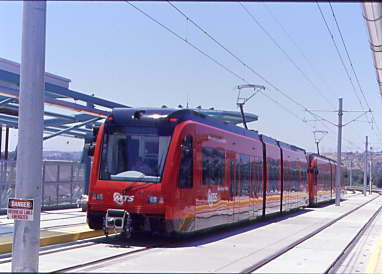 Blue and Orange Line trains may consist of one to four cars. 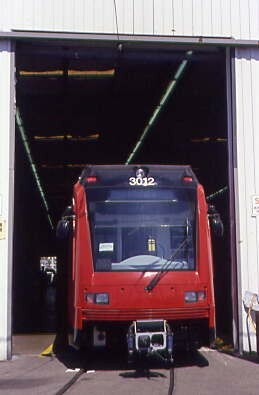 Each LRV is equipped with an Americans with Disabilities Act approved wheelchair lift that is able to cycle in 90 seconds. They also have air conditioning and heating. 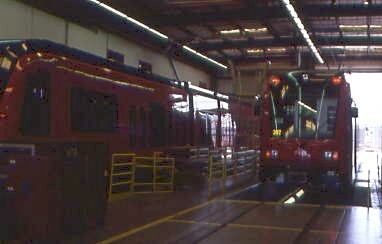 A new SD 70 car. 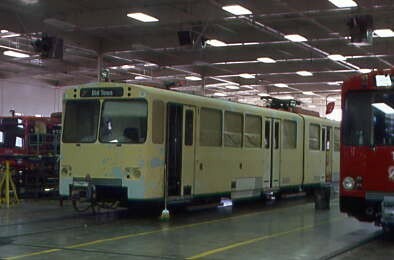 The Green Line will have 11 of the new S70 cars. The biggest innovation is the low floor, which permits passengers to get aboard with a simple baby step instead of two or three big ones. 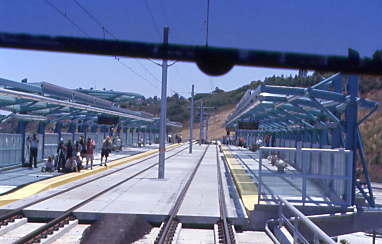 Passengers in wheelchairs will roll in and out of the cars over a short bridge plate that extends from the car to the station platform, creating a short ramp between the trolley station platform and the car. 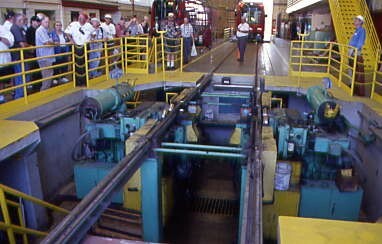 The procedure is faster and easier than the mechanical lifts used on existing trolleys. 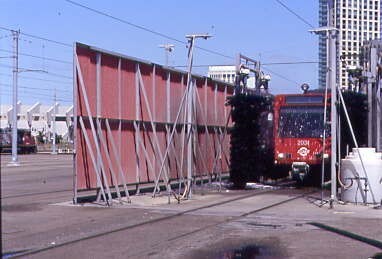 Two bridge plates are on each side of the vehicle, serving the middle two doors. Passengers operate them by pressing an illuminated button off to the side of the door. The door remains shut while the plate moves in and out of position. 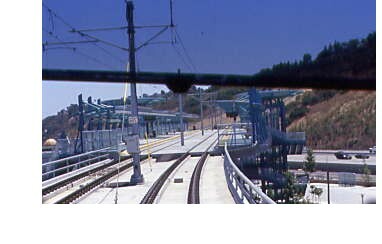 The bridge plate is the reason trolley stations have to be raised two inches to accommodate the S70s. Otherwise, the ramp will be too steep for wheelchairs. Inside, the low floor accounts for 70 percent of the interior of the car, hence the S70 model designation. These cars seat 68 passengers with space for 4 wheelchairs. Jeff met me early at my house as I was watching Classic VH1 Classic Connection. We drove down to Santa Ana where we watched the 4th Street Crossing Gates malfunctioning. Surfliner 763 came into town running a few minutes late and once he left eight minutes later our Surfliner 564 came into view. We boarded and walked back to a Superliner Coach for our trip to San Diego. Ken Ruben quickly found me and had some things he needed to discuss with me like calling Lets Talk Trains this morning. Normally Richard Hamilton would be joining us for a trip like this once we got to San Diego but he is doing the Lets Talk Trains show today from Pasadena at the Santa Fe Historical and Modeling Society Annual Convention. South of Irvine Chris Parker came back to talk with me about the Trains Unlimited Trip to Portland next week and other things. The Surfliner ran a perfect trip to San Diego. We detrained and went straight to the America Plaza Trolley Station to wait for the first trolley to 12th/Imperial. 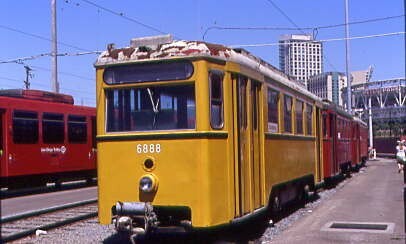 A Blue line Trolley came along and we boarded for the six stop trip. We walked from the Trolley Station over to the check in area which was the outdoor trolley employee break area. Here we were checked in and given name badges to wear. After I talked to many of the people that I know, the group was given an introduction and a safety lecture. Here I met our Trolley Operator Barry and after he was done our Tour Guide John Taratona. Ken got my attention so I could talk to the Lets Talk Trains Internet Radio Show that is live almost every Saturday from 10 AM-12 PM Pacific Time or 24/7 in the achieves. After a few more minutes of safety tips we began our shop tour. Our group of 100 people then began the tour in the "A" building. Inside the "A" shop a U2 Car. 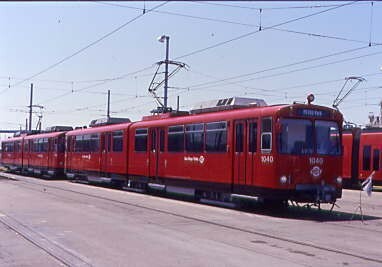 The Trams from Austria the San Diego Electric Railway Association now own. 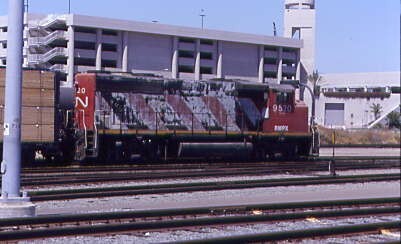 A SD100 Car basking in the San Diego Sunshine. A brand new S70 car enjoying a beautiful San Diego Day. "Don't move here!" 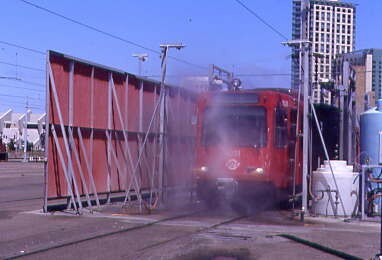 One really neat thing about the tour was they showed us how the Car Washer worked by running SD 100 2031 car through it. Next, John talked to the group about the solar powered switches and demonstrated how one worked, several of the group took pictures of the ex CN 9520 GP40-2LW that the San Diego and Imperial Valley uses. Another view of a new S70 car. A U2 car with the first ever Petco Park in its destination sign. 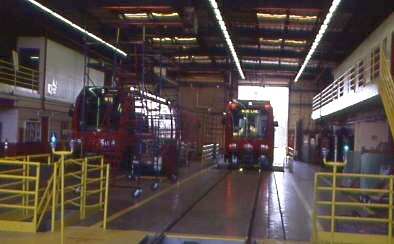 After getting the clearance from Trolley operations we all walked across the Blue Line to the newer shop also known as the "C" shops. It was recently named the "Langley C Powell Maintenance Building" in honor of the first President of SDTI. 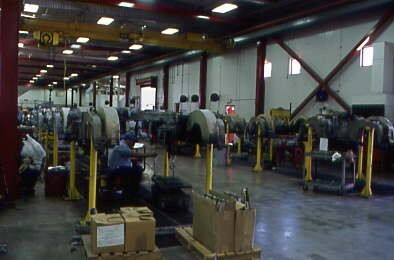 Views inside the "C" Shop. A Trolley in primer ready for the paint shop. 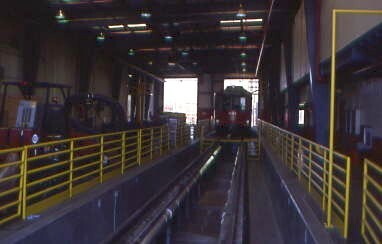 A view of the truck washing area. 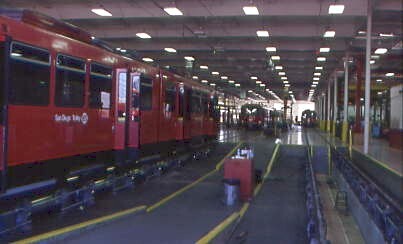 With that last picture we finished our tour of the 'C" Shop and walked as a group over to the new S70 cars that would be used on our tour. While I really wanted to finally tour the shops, now we were going to do the main reason I came for a ride over the newly built Green Line. Our train was two of the S70s coupled together numbered 305 and 306. 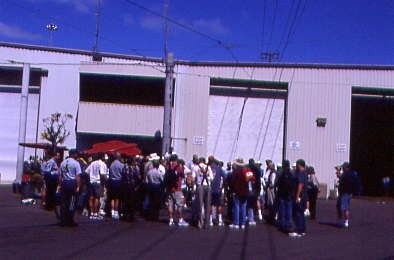 Since I will be at the 2005 NRHS Convention in Portland the day the line opened to the public on July 9th 2005 I wanted the chance to ride and write a story about it. It would be free rides on that day and then fare paying passengers after that. 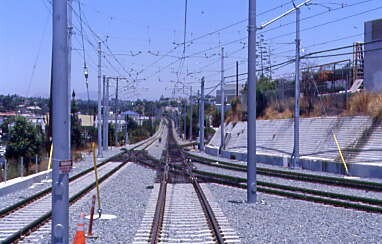 The Green Line will be from Santee to Old Town, the Blue Line would now run from Old Town to San Ysidro while the Orange Line would run from Gillespie Field to the Convention Center and 12th/Imperial. Once we had received our clearance to depart we slowly went out of the yard to the junction with the Orange Line. 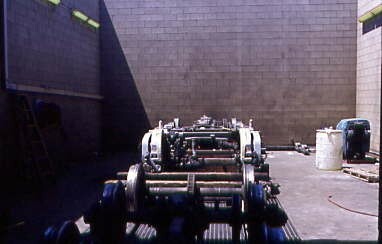 Another view of the ex CN engine. Once we had received our clearance to depart we slowly went out of the yard to the junction with the Orange Line. We waited for a westbound Orange Line Train heading for 12th/Imperial. There was a baseball game at Petco Field on this day with the San Diego Padres defeating the Seattle Mariners 8-5 later in the afternoon. Once we cleared we crossed over onto the Orange Line to start our trip to the new Green Line. We were going to run nonstop to the Green Line but slowed down for all the stations as they were crowded with baseball fans going to the game. The Gas Lamp Station had a large crowd as it is the main stop for Petco Park from the north. We ran through the Convention Center and by Seaport Village. Moments later we slowed at the junction of the Orange and Blue Lines that makes a wye with no normal service over the connection between the two. The exception are deadhead moves to the yard or the baseball game to Petco Park. We went by the Santa Fe Depot as I saw Surfliner 775 disappear into the distance. Moving north we went by the County Center/Little Italy. Next we went under two streets then climbed over another street. We descended going by Middletown and onto Washington Street. We slowly cruised through the Old Town Transit Center where there were plenty of Padre Baseball Fans. 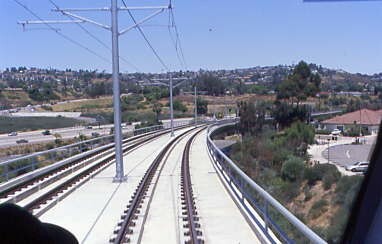 We turned as we crossed the San Diego River to the Moreno/Linda Vista Station. 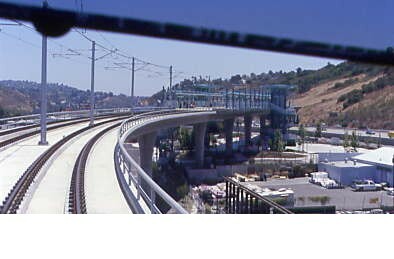 Making an "S" curve that took as over the San Diego River and along a golf course to the Fashion Valley Transit Center then on through the Hazard Center. We crossed up and over the San Diego River to the Mission Valley Center. Crossing the San Diego River again we ran through the Rio Vista and Fenton Parkway. 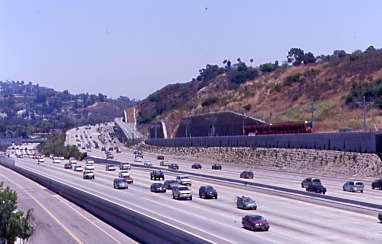 Our route then became elevated taking us to Qualcomm Stadium before we neared Mission San Diego. For the first time ever we did not cross over to the North Track as we headed into and through the San Diego Mission Station. 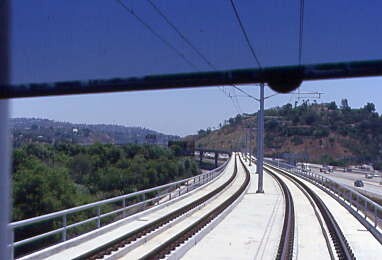 From here we entered the newly built line and continued elevated over the San Diego River. 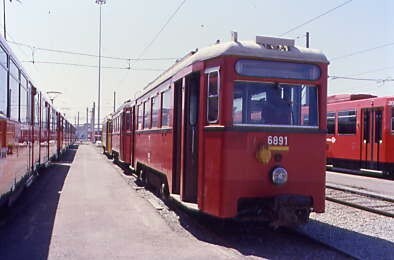 The Trolley approached the Grantville Station which is located 40 feet above the ground. A few static pictures of the S70s at the Grantville Station. They did a Photo Runby in the station and I choose to stay on in order to take pictures of our group taking pictures of SD70s entering the Grantville Station. 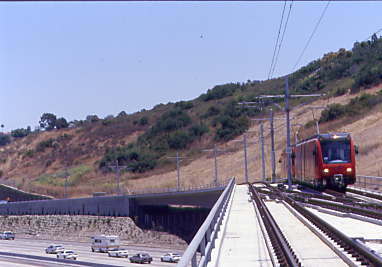 A second Photo Runby was done with the S70s heading east over Interstate 8 and up the steep grade. We all reboarded and took off again crossing Interstate 8 and starting up 4.4 % grade. More views of the climb up the grade. As we closed in on the West Portal of the Tunnel we turned into a small canyon and crossed a bridge. 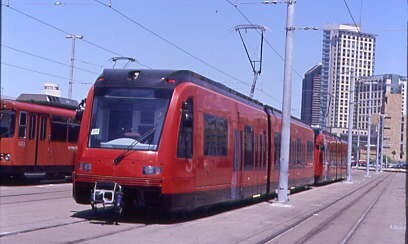 We slowed to 10 MPH as we entered the 4000 foot tunnel the first for the San Diego Trolley. 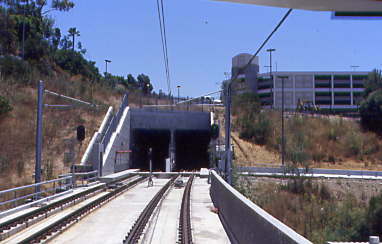 In the middle of the tunnel is the SDSU Transit Center. Here we paused for a bathroom break. We took the escalator or stairs up into the upper part of the station and to some bathrooms outside the station. 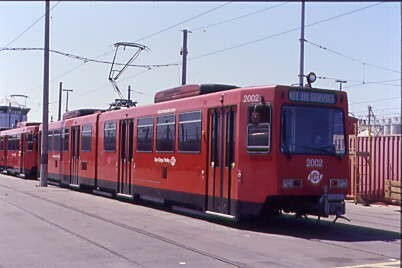 A picture of the S70s in the SDSU Station. As we left the "I" indicator was lit which means there was an intruder in the tunnel. This could be a person, bird, rat or the like which meant we had to run at restricted speed. We exited the tunnel back into the light of the day. Our trolleys continued climbing along the canyon wall in order to reach the valley floor ahead. We crossed a small creek on a bridge. We raced along the valley floor. 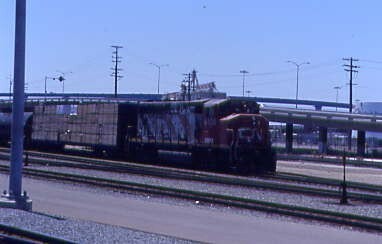 The SD70s ran through Alvarado Medical Center which has a riddle along the top of north embankment wall. Next we ran through the 70th Street Station. We climbed up and over Interstate 8. We rejoined the Orange Line at Baltimore Junction before we rolled to a stop at Grossmount Center where Ken and another passenger got off. 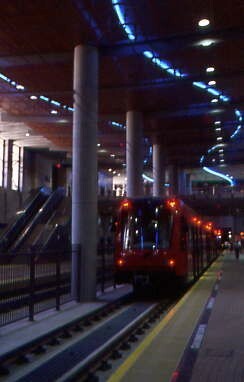 I must say that this new Green Line is the most dramatic and engineered light rail line that I have ever ridden. I was very impressed by the whole construction of this line. Ken had to be on Surfliner 583 in order to get to the Santa Fe Historical and Modeling Society Annual Convention Banquet in Pasadena tonight. 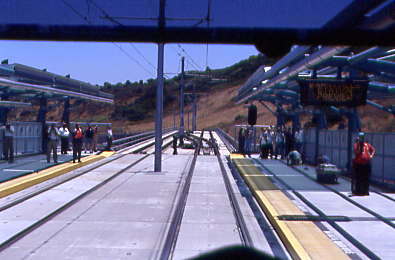 Our S70s continued rolling through the Amaya Drive Station and onto the El Cajon Transit Center. We bridged up and over Interstate 8 to Amele Drive before we climbed up and over the last of the freight line and the Fetcher Parkway. 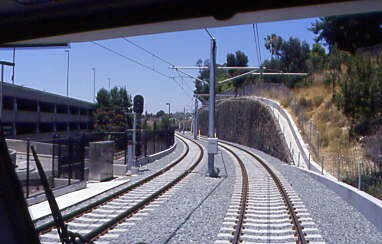 The line then made a series of curves to the former Weld Blvd Station now know as the Gillespie Field Station. We turned onto North Cuyamaca Street which we ran up the middle up to Mission Gorge Road where we turned into Santee Town Center where our tour paused an hour for lunch. The SD70s rested at Santee Town Center while our group ate lunch. Jeff, Chris and I went to Quiznos for our meal. The S70s at rest at Santee Town Center while our group ate lunch. Jeff, Chris and I went to Quiznos for our meal. The time was now beginning to get critical for people taking Surfliner 785 home. It was decided that we would run nonstop to the Santa Fe depot so no one would miss their train. We waited after the Orange Line Train left for the next one to arrive. The switch was thrown by hand and then restored after we left. Barry did a great job of running back to the Santa Fe Depot. We all got to see just how great a Trolley Operator he was. When we reached the tunnel the "I" indictor light was on so we ran under restricted speed to the station where we found the other end of the tunnel "I" light was on so we continued running restricted until we left the tunnel. If you thought the grade was steep climbing just wait till you all see it descending. One word, "Impressive!" Nearing Grantville we came to a red signal which Barry had to get permission to pass. 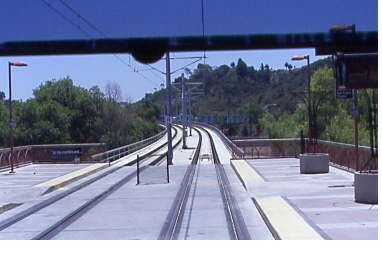 Once we neared the San Diego Mission Station we hit another red and learned that we would be following a Blue Line train. We dropped off one of my favorite people who I can not ever remember his name at the Mission Station. Barry then did a perfect job of running up to red signals then having turn to yellow right before we arrived. After Fashion Center the yellows turned to greens and we were off to Old Town where a few more passengers were let off. 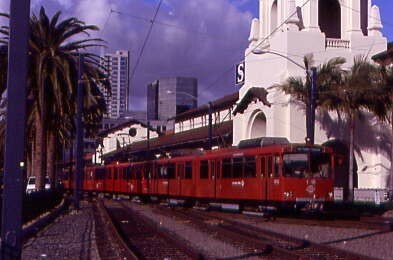 We then made a quick trip to the Santa Fe Station arriving there after a near miss of a man crossing in front of our Trolley. Jeff and I as well as a few others left the group and walked over to Surfliner 785 with four minutes to spare. Surfliner 785 took us home right on time to Santa Ana where I took a picture ending a wonderful day with the San Diego Electric Railway Association on their Green Line Tour. 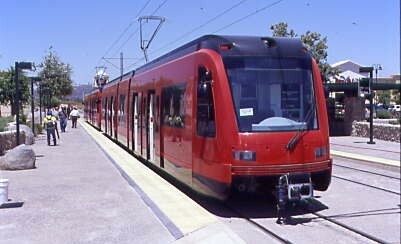 A big thank you to not only them but to all at San Diego trolley especially Barry and John.